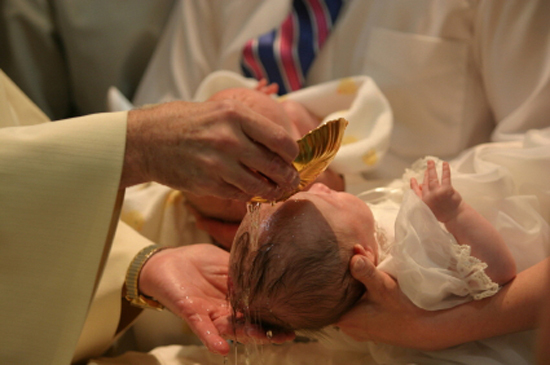 A christening is similar to the baptism ritual that is performed by Christians where water is used to give acceptance to a person in a church and is meant to protect that person’s soul from evil. The biggest difference is that a christening is lined up by the parents of an infant where a baptism can be for anyone regardless of age. Like a baptism a christening is an extremely important event for Christians and just the fact that you get invited is an honor in itself. So what should you wear to a christening? • Women: Women can wear a number of outfits similar to what they would wear to go to church. One can’t miss outfit is a nice pair of dress slacks with a blouse that is sophisticated looking and that may even have some frills on it. For shoes a nice pair of closed toe pumps will look rather nice and always accessorize moderately. Again, you are going to be in a church so dress that way. • Men: Men too can revert to what they would wear if they were going to church. A pair of dress slacks topped off with a nice long sleeved button down shirt is a sure fire outfit that can’t go wrong. You probably don’t want to go with a neck tie but if you think you might want to simply carry one in your pocket and see what everyone else has on. This way you will not feel out of place if you are the only one to have on a neck tie. At the same time if you see that most men are wearing a neck tie you can quickly go to the restroom and put yours on. Be sure that you are wearing black dress shoes with your outfit and leave the sneakers at home for the christening. • Kids: Even the kids should be dressed as though it where a regular church service. This means cute Sunday dressed for the girls with nice church shoes. The dress can be a cheery color like yellow and a nice touch is a matching color bow in their hair. Boys can wear slacks with a long sleeved button down shirt and should be wearing black church style dress shoes. This will keep them looking as sharp as the men and they will be more than adequately dressed for the christening. Remember that a christening is a very important day for the infant and the family and the fact that they asked you to be a part of it is something to feel good about. Show them that you are glad to share in their happy day by doing your best to dress to impress.